1. On a high: September has been very kind to investors. 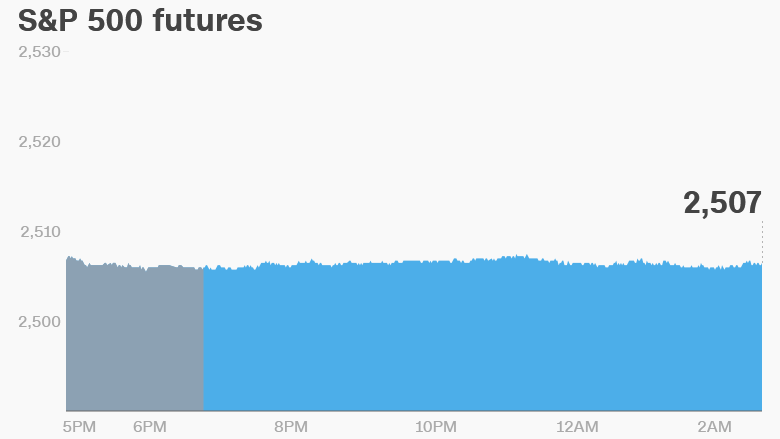 The S&P 500 added 0.1% and hit a closing high on Thursday. The Dow Jones industrial average and Nasdaq were little changed on Thursday, but hit record highs last week. Investors this week cheered President Trump's plans for tax cuts and a simplification of the tax code. U.S. stock futures were holding steady on Friday. 2. Global moves: European markets were mixed in early trading. Investors in Spain are looking ahead to a controversial independence referendum in the Spanish province of Catalonia on Sunday. Catalonia's separatist government is adamant it will go ahead with a referendum to decide if the region should split from Spain, despite the country's highest court banning the vote. The region, which is anchored by tourist hot spot Barcelona, is one of Spain's most powerful economic engines. Madrid is seeking to stop the vote. In Asia, most stock markets ended the week with small gains. Oil prices were flat and precious metals were trading higher. 2. Happy birds: Rovio Entertainment, parent company of the Angry Birds franchise, has priced its initial public offering at €11.50 ($13.50) per share. The offering values the Finnish tech firm at over $1 billion. The shares will starting trading on the Nasdaq Helsinki's official list on October 3. 3. Volkswagen costs: Volkswagen (VLKAF) set aside an additional €2.5 billion ($3 billion) to buy back and retrofit diesel cars in North America. The buyback program is part of the settlement agreed with regulators over the German automaker's sprawling diesel emissions cheating scandal. 4. Stocks to watch -- Tyson, Roku: Shares in Tyson Foods (TSN) were about 5% higher premarket. Shares in Roku (ROKU) will be closely monitored in New York after the stock surged 68% in their market debut on Thursday.